I decided to play with one of my favorite Hero Arts color layering stamps – the hibiscus can be stamped in almost any color and it is guaranteed to be gorgeous. I used several shades of pink for the flowers and just stamped the veins of the leaves on white cs. The black centers of the flowers and the veins were stamped in black ink and clear embossed so they are quite shiny. I have had a hard time finding black and white striped paper so made my own by cutting 1/2″ strips of black cs and then adhering to a white base. The sentiment was a gift from a friend (she kindly sent me a lovely selection of sentiments stamped on vellum) – and how nice to have them handy to add to a card. To finish the card I used a black base and scattered some clear and black sequins. There is still time to enter our “pop of color” challenge this month – a great prize from our generous sponsor The Ton is awaiting some lucky stamper! Another really beautiful card, Betty! I love the different shades of pink on the flower petals, and stamping the leaves in black is such a clever idea…Love it! Absolutely gorgeous card, Betty! Gotta put that set on my wishlist now! Wow, Betty – just love the background you created with the black strips of card!! Perfect for your layered hibiscus flowers!! This looks so bold and chic, Betty! 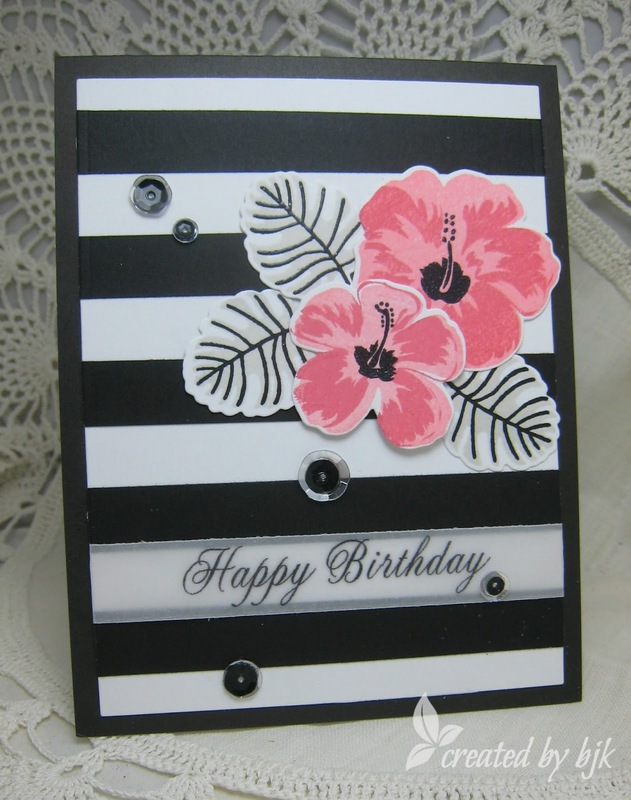 Love the pop of layered stamped hibiscus flowers on the bold striped B/W background!